It is so hard to believe that school is almost out. Seems like I was just writing about Jude’s first day of school in August! Crazy. 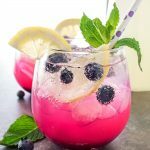 With the days of school coming to an end it is time to think about some fun and creative end of the year teacher gifts. This year I decided to go with something that the teachers could enjoy on their upcoming days off with their families. Baking!!! 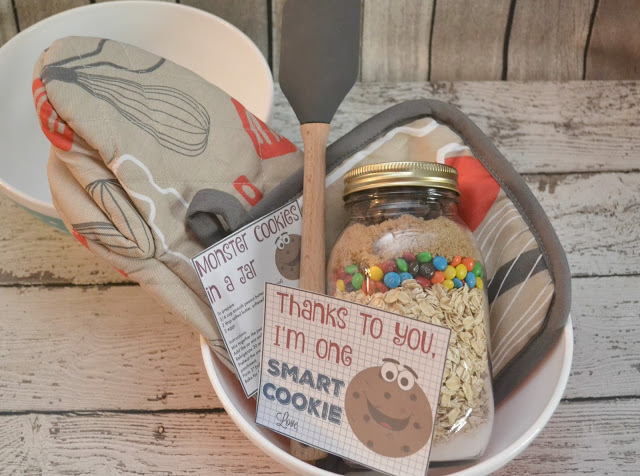 I made these super adorable and easy Cookie Mixes in a jar and put them with some great baking essentials to create a gift that will be usable and special for each of those amazing teachers. I headed to Target to pick up all of my items and left feeling so excited. Target never disappoints!! 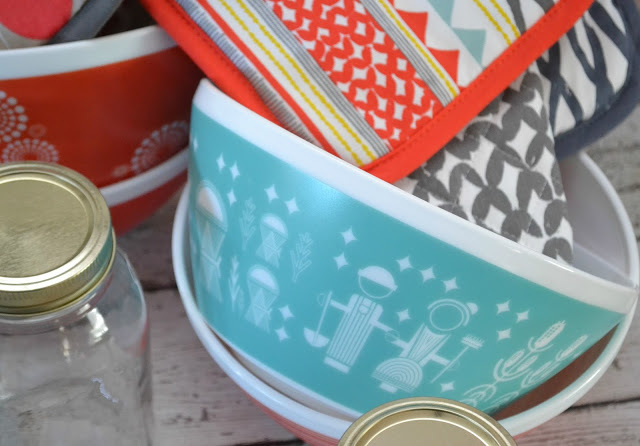 Shameless plug – head to Target, vintage mixing bowls!! OH MY GOSH!! I want them all! Once you have done your shopping it is time to assemble the cookies in a jar. Again, a simple project that ends up looking like you spent hours creating! Bonus for us crazy moms at the end of the school year. 1. 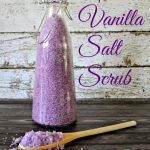 To begin filling your jars start with combining sugar, baking soda and salt in a medium bowl. Once completely mixed, pour into jar to begin layers. 2. Next, layer rolled oats on top of the sugar mixture in the jar. 3. Add candy on top of the oats. 4. Carefully add the brown sugar on top of the candies. 5. Lastly, top the jar off with the mini chocolate chips. 6. 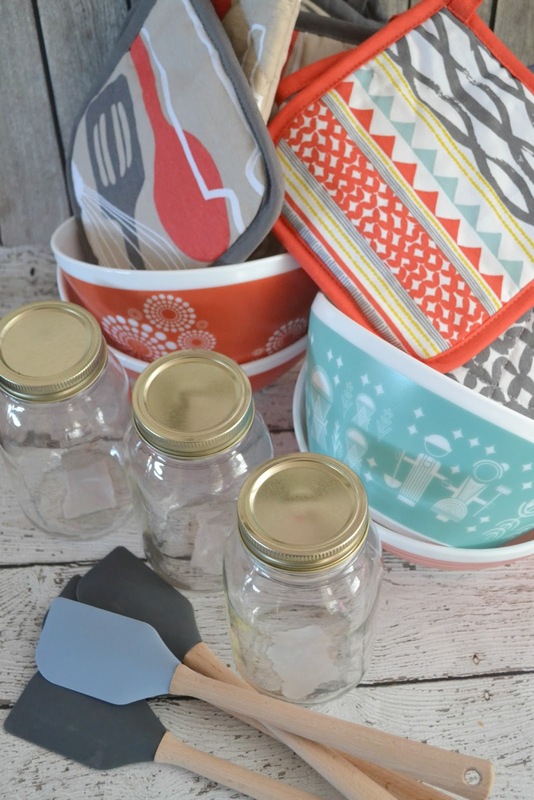 Seal jar and add recipe card and jar to the teacher gift. 7. In a large bowl mix the peanut butter, butter, eggs and vanilla until well combined. 8. Add the jar mix and stir well to combine. 9. Refrigerate dough for 30 minutes. 10. Preheat the oven to 350 degrees and prepare cookie sheets with parchment paper. 11. Form 2″ balls of dough and place on the cookie sheets. 12. Bake cookies for 14-16 minutes. 13. Let cookies cool completely before enjoying! I made four jars of cookies in less than 15 minutes. It was so easy and I love the layered look! 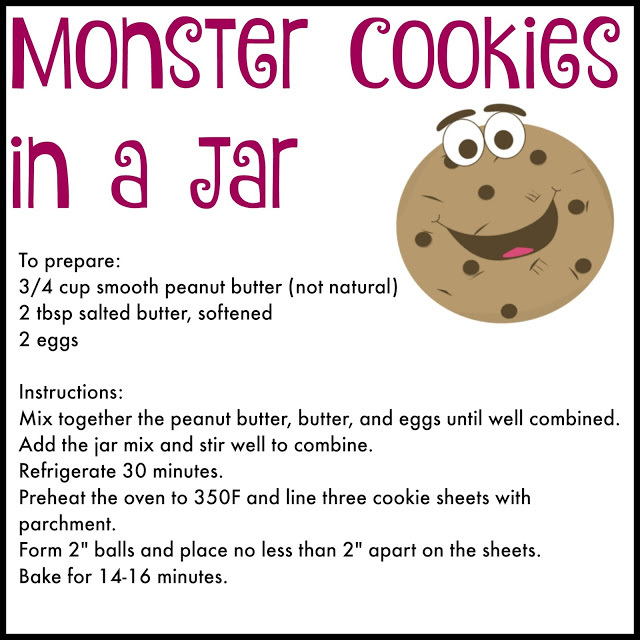 Make sure you use this FREE printable recipe card to add to your gift bowl – it will give the easy instructions for the teachers to use when they prepare their Monster Cookies! Yummy!!! The finished product is cute and perfect for a fun day of baking. I added a silly gift tag and will have Jude and Teagan sign their names for their teachers. I cannot wait to present these end of the year teacher gifts in a few days!! 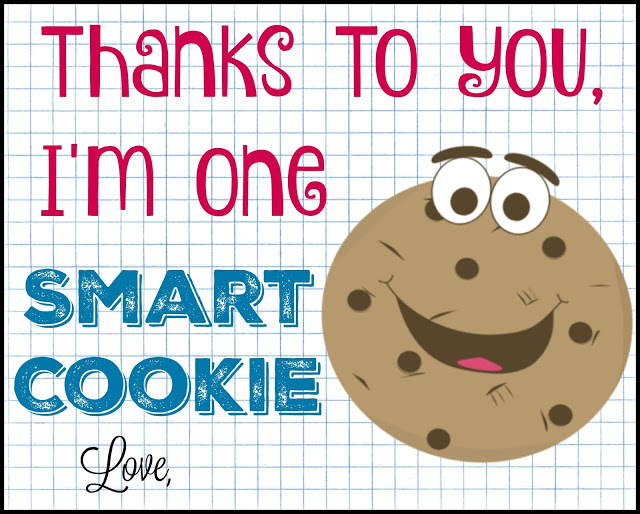 Download FREE gift tag here. What creative End of the Year Teacher gift do you have planned? Post contains affiliate links. If you decide to make a purchase through my link, Amazon will pay me a commission for it. This doesn’t cost you anything additional. These commissions help to keep the rest of my content free, so thank you! This is a cute idea, especially with the entire gift basket and not just the cookie mix. I bet teachers will love this! This is such a sweet idea! 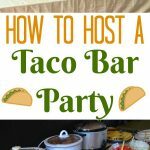 I have been thinking of what I could do for my kids teachers and this is a fun and simple idea. Whenever we give cookies in a jar, these are well received. Love the printable to make things easier too. What an awesome idea. We have teacher friends…and I know for a fact they would both LOVE this!! This is the absolute cutest teacher gift everywhere. Maybe I should make one for myself!! I love this idea. I love homemade gifts. It really shows that you care. That's a fun idea, rather than just baking cookies and giving it to them. Especially if the teachers have little ones of their own. I don't have kids so not teacher gifts  but I put a lot of thought into the gifts for my parents and also my boyfriend. What an awesome teacher gift! A huge upgrade from APPLES lol! That is such a cute gift for teachers. Now that I have two kids in school, I have a lot of gifts to buy for teachers, bus drivers, aides, and more. This is such a great idea for the end of year teacher gift. Will save this post for sure! 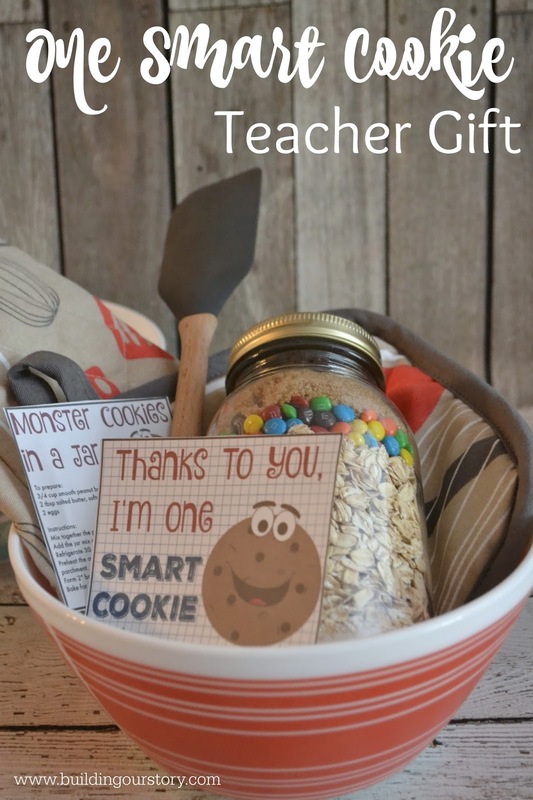 This is so cute and the perfect teacher gift! I love the naming of it "one smart cookie" too cute! I also adore that you packaged it all up in a mixing bowl!! This is soooooo cute! It's actually one of the best homemade Teacher gifts I've seen in a long time, how cool! So meaningful and straight from the heart…..love it! This is cute. 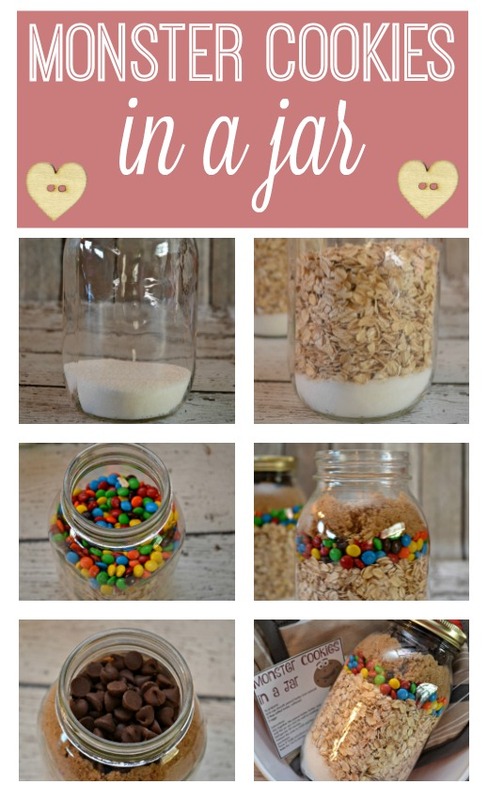 I have given the cookie mix in a mason jar before, but I have never included a bowl with it. 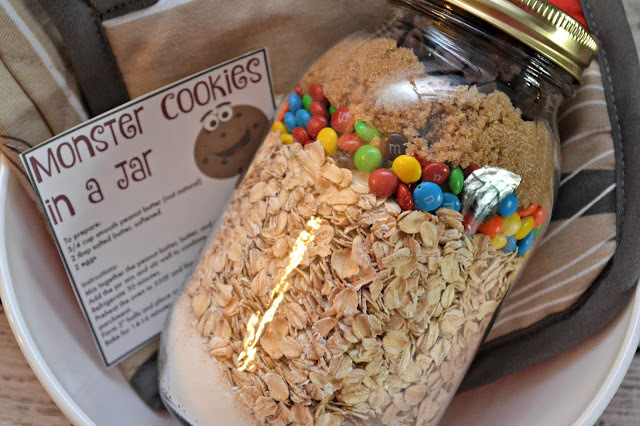 That is a good idea to expand on they cookie mix in the Mason jar gift idea. This is a super cute idea! I love it! I like the idea of giving my daughter's home-ec teacher a gift like this one. She has been so nice and my daughter enjoys her a lot. I think I need to pick some stuff up and do this for her, thanks for the inspiration! This is so thoughtful! I will definitely be passing this on to my sister. It's a great way to appreciate the people who teach the young ones that we have. Thanks for the tip! Those mixing bowls are too cute!! Love! They look super vintage. Cookies in a jar is a gift I would love to receive and also a gift I would love to give. I still need to make neighbor gifts… maybe this will be what we make! This is seriously so creative! I wish I'd thought of this! 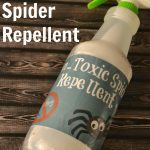 I spent days trying to figure out the perfect gift for my son's teacher and I completely failed! I ended up just getting her some flowers! I think she would have loved this!